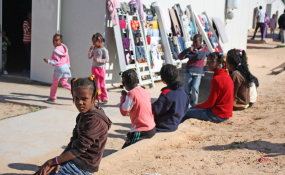 Children at the site for people displaced from the town of Tawergha during the 2011 Libyan civil war. "Airport Road / Turkish compound" site in Tripoli, November, 2011. Geneva — Unaccountable and violent armed groups maintain a stranglehold on Libya, while civilians pay the price in the divided country, Human Rights Watch said today in its World Report 2019. Libyan authorities should prioritize justice sector reform and establishing accountability, particularly for members of armed groups. Seven years after the end of the 2011 revolution in Libya that ended the rule of the strongman Muammar Gaddafi, Libya has two competing governments that have been unable to reconcile. They contest control over territory, institutions and resources, while armed groups linked with them unlawfully kill, forcibly disappear, torture, and arbitrarily detain people and have forcibly displaced thousands. Government-aligned forces and militias have kept thousands of migrants and asylum-seekers in detention centers where conditions are inhumane and physical abuse is routine. "Militias have been terrorizing both Libyans and migrants while no authority dares stand up to them and hold them to account," said Hanan Salah, senior Libya researcher at Human Rights Watch. "Until this changes, prospects remain dim for holding free and fair elections." Protracted armed conflicts have hobbled key institutions in Libya, such as the judiciary, which functions only partially due to threats, harassment and attacks against judges, lawyers and prosecutors by militias. Where courts function, there are serious due process violations. In August, in one example, a Tripoli court sentenced in one mass trial 45 suspected former Gaddafi supporters to death and 54 others to five years in prison for the killing of protesters in 2011 despite allegations of serious due process violations. Despite a mandate to investigate war crimes, crimes against humanity, and genocide in Libya since 2011, the International Criminal Court has only issued one arrest warrant since 2011, against a Benghazi-based commander affiliated with the Libyan National Army (LNA) forces, allied with one of the competing governments, who remains at large. As a result of the conflicts, 200,000 people remain internally displaced. Thousands of families who fled clashes in Benghazi since 2014, and armed confrontations in Derna since May 2018 are unable to return to their homes or to reclaim their properties and livelihoods for fear of reprisals by LNA-linked groups who accuse them of supporting terrorism. Representatives from the cities of Misrata and Tawergha signed a peace accord in June that should have paved the way for the return of 48,000 people unlawfully displaced from Tawergha. But, only a few hundred have returned, due to the massive destruction and looting and ongoing security concerns and fear of reprisals. Clashes between Tebu and Arab local militias in the south between February and June killed scores of civilians. In September, month-long clashes between rival militias in Tripoli left more than 100 people dead, including many civilians, according to the United Nations. Although the extremist group Islamic State (ISIS) has controlled no territory in Libya since its ouster from Sirte in December 2016, it staged several deadly attacks that targeted civilians. In May, ISIS claimed an attack in Tripoli on the High National Elections Commission that resulted in the deaths of 12 people, some of them civilians. Militias and government aligned armed groups harassed, detained, and attacked journalists and media professionals. Journalists reported that the Government of National Accord, the internationally recognized government, imposed restrictive measures against international journalists and TV networks, including by imposing government minders during visits to Libya and limiting access to officials and institutions, as well as migrant detention centers.